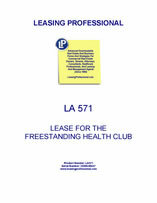 (a) Landlord does hereby lease and let unto Tenant, and Tenant does hereby hire and take from Landlord, “the Premises”, being that certain Health Club located in shown on the attached Exhibit “A”, which Premises is commonly known as “THE HEALTH CLUB AND PRO-SHOP”. The parcel of real property on which the Premises is located is herein referred to as the “Land”. (b) Acceptance of Premises: By taking possession of the Premises, Tenant shall be deemed to have agreed that it has inspected the Premises and that the same are suitable in their present state and condition for the purpose set forth in Paragraph 6. Taking of possession of the Premises by Tenant shall also be conclusive evidence that the Premises were, on the date of taking possession, in good, tenantable condition. Landlord shall have no obligation to make any post-possession alterations, changes, improvements, repairs, or replacements whatsoever. Tenant acknowledges that Landlord has made no warranties regarding the value, condition, fitness, or suitability of the Premises or the appropriateness of their use for Tenant’s business. Landlord leases to Tenant and Tenant leases from Landlord the Premises specifically designated on the building layout map, attached as Exhibit A, and incorporated by reference. (a) Rent: Commencing the later of _______, 20__ or the first (1st) day of the third (3rd) month after which Tenant commenced business (inclusive of such month of commencement), Tenant shall pay to Landlord during the lease term the sum per month of ___________________ ($), plus ______ per cent (%) of gross sales from all retail goods sold from the Premises, plus twenty per cent (20%) of revenues from Health Club memberships commencing with the first such membership. Landlord shall have unrestricted access at all reasonable times, to Tenant’s books and records to confirm the amount of percentage rent so due. Tenant shall pay base rent to Landlord in advance, without demand, deduction, or setoff, on or before the first (1st) day of each month during the lease term, at Landlord’s office. The percentage rents shall be paid in arrears, without demand, deduction, or setoff, on the first (1st) day of the following month. If rent is not received by Landlord by the fifth (5th) day of the month in which due, a late charge equal to four per cent (4%) of the amount of the rent due shall be automatically assessed and become immediately due and payable. If the Health Club membership percentage rent paid to Landlord by Tenant through _________, 20__, does not aggregate _______________ Thousand Dollars ($_______), Tenant shall, no later than January 15, 20__, pay to Landlord the difference between ____________ Thousand Dollars ($_________) and such aggregate payments to Landlord through December 31, 20__. Thereafter, the twenty per cent (20%) percentage rent shall continue. For purposes of calculating the Health Club membership rent due Landlord, the total membership fee for which a contract is signed shall, notwithstanding installment payment therefor by the member, be considered a part of Health Club membership revenue for the month of execution of the contract.